You’ve probably seen the U.S. blitz promoting AARP’s DividedWeFail.org, in which handsome folks 50+ talk in 30-second TV spots about the need to do something about healthcare. The funny thing is, you need to do something, but what, AARP doesn’t say. 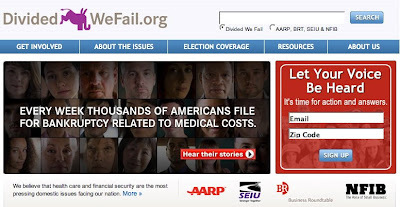 Visit the AARP destination web site, dig around, and you’ll find advice on setting up community groups or writing letters to your editor to promote DividedWeFail. But no stance, no solutions, no policy suggestions. Universal health care? Health savings accounts? Reduced hospital expenses? Stronger oversight? The AARP is deathly quiet on any possible concrete point of view. We wonder if this is really just a recruitment drive. AARP now has 39 million members and the aging Baby Boomer population is tipping in its direction … but the group has a bit of a stale brand rap. AARP is known as an organization for old people, and the cool Dennis Hopper types now growing silver may not itch to be active participants. Active membership is important; the LA Times has noted the AARP derives more revenue from insurance sales to its members than from membership fees. If so, the AARP campaign is a nice Trojan Horse for grabbing attention. Take a hot issue and get people to sign up. For what? Maybe that doesn’t matter.